Across many Asian markets, health insurance is a popular and highly sought-after product, from the perspective of end consumers as well as insurance providers. An increasing demand for healthcare across Asia stems fundamentally from the steady population growth, escalating medical costs and growth in wealth across Asia, all of which increases the per capita consumption of healthcare services. Health insurance is often regarded as a “door opener” for sales agents, providing an opportunity to make a convincing sale and then to market other higher commission products. One main reason private health insurance has a strong demand in Asia is due largely to the limited state-funded health insurance support in many Asian countries, or the quality of such state-funded health care is poor, thereby increasing the demand for privately funded/owned health insurance. Despite the strong demand, this is not a product recommended for all insurance providers' portfolios. Health insurance is easy to sell but exceedingly difficult to manage. 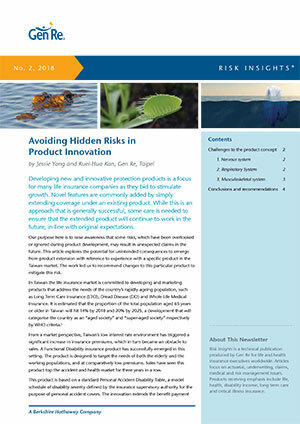 Before an insurance company jumps onto the bandwagon to launch a health insurance product, it should be aware of a number of considerations and challenges and consider how it would or could manage the multifaceted risk. When considering the “players” in a life insurance product, we often see three main parties involved, namely the insurance company, sales agents and the consumer (insured). In a health insurance offering, a fourth party joins this game – the healthcare providers (i. e. hospitals, doctors, surgeons). The insured’s motivation in purchasing a health insurance policy is to have an affordable coverage that pays for comprehensive medical treatment when required. The sales agent wants to earn his commission, whilst the healthcare provider, although with primary objective of treating patients, is also focused on maximising its profits. The insurance company, whilst profit-centric, is essentially interested in providing a viable and sustainable product to the policyholders. Since the interests of each of these parties in the “healthcare game” are not aligned, their opposing forces render the management of a sustainable, affordable and profitable health insurance product a great challenge. Nevertheless, it is in the interest of all these parties that the levers work in sync; a fall out of one part will render the entire ecosystem unviable. From the insurance provider’s perspective, depending on the type and scope of the health insurance plans it is providing, one of the greatest challenges in maintaining the cost of the healthcare premium lies in its ability to negotiate and control the charges levied by the healthcare providers on its policyholders. Without strong negotiating power, the insurer would very quickly experience rising cost of claims beyond the expected healthcare inflation. The cost of medical inflation has to be built into the pricing of a health insurance product. Actuaries consider the number of years of medical inflation to be priced into the premium rates, and this can be a challenging task, as many factors can influence this inflation figure and often make prediction difficult. The intricacy of medical insurance product pricing is one of the factors making a medical portfolio “difficult to manage”. 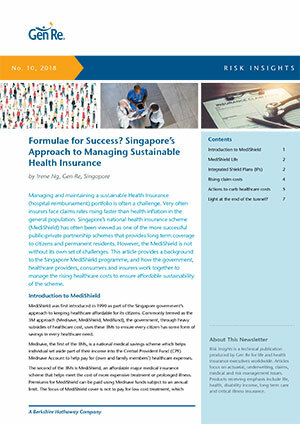 The remaining sections discuss some other trends seen in medical portfolios in Asia and possible measures insurers could consider putting in place to better manage loss ratio and increasing premium charges. Not surprising to see in medical portfolios, we often see higher utilization rate of medical services and facilities as compared to that in the general population. 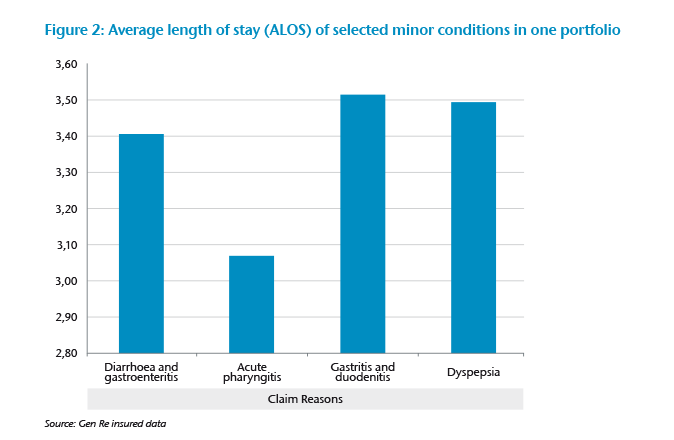 These include longer average length of stay in hospital, frequency of medical consultation/admission, frequency of investigation and number of investigations per diagnosis. The average length of stay is perhaps less of an issue in countries with insufficient supply of hospital beds to meet demands, such as in Singapore, but more of a noticeable issue in countries with greater supply of hospital beds, and disproportionately so in larger cities where the proportion of insured population is also higher. It is also often experienced that an insured patient utilizes more of the hospital facilities (e. g. investigations, tests, scan, etc.) as compared to an uninsured patient for the same diagnosis. Doctors are often guilty of causing this as they would recommend all tests available, whether necessary or recommended for the medical condition, since the costs will be largely borne by insurance companies. Most patients would not be able to decide whether all these tests and investigations are necessary and would go along with any recommendations from the doctors, always with full confidence that if the doctor recommends it, it must be necessary. 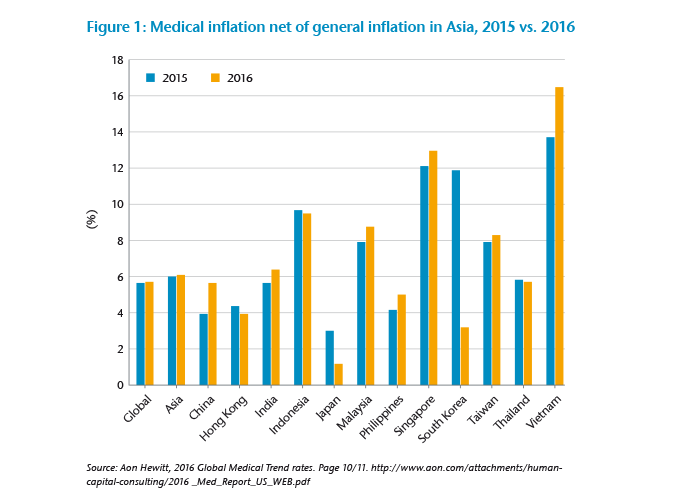 A more significant differential is seen in other Asian markets, especially where there is significant government subsidy for treatment in public hospitals. Holders of private health insurance cover would tend to prefer treatment in private hospitals due to the shorter waiting time and better care, thereby pushing the cost of claim upwards. There is also experience showing that doctors inflate the charges when a patient has comprehensive health insurance, reflecting the mentality that insurance companies will pay for such costs, thereby not hurting their patients financially. As with any form of insurance, anti-selection is an issue of foremost concern to insurers. This is more apparent for health insurers, as the impact of anti-selection is seen more acutely in health portfolios. Typically in Asia, a health insurance product has a 30- to 90-day waiting period, whereby admission during this period will only be covered if due to accidental causes. It is not uncommon to see that the incidence of claim peaks right after the waiting period before stabilizing to a normal level. 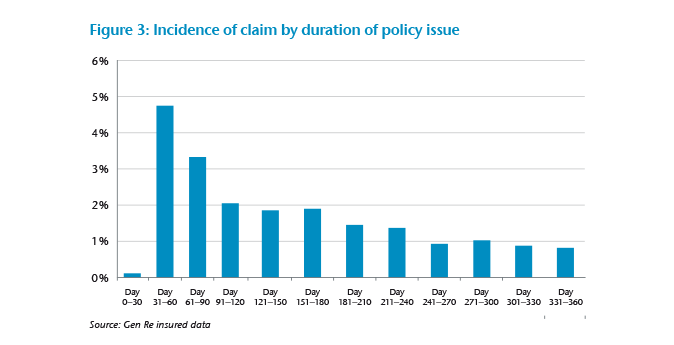 This is seen very clearly in one portfolio studied by Gen Re (see Figure 3) where the incidence of claim peaks right after the 30-day waiting period at 4.7% at days 31-60, as compared to less than 1% at 1 year post policy issue. This shows obvious anti-selection, where the insured either has the intention of attaining a hospital consultation prior to policy issue, or waiting out the waiting period before getting treatment so as to be covered under the policy. The challenges to a health insurance portfolio are complex, multifaceted and differing in different markets. The same product could work well in one market but cause significantly high loss ratio in another. Multiple factors can influence the experience of a health portfolio, and not all control measures are equally effective in all markets. Below are some suggested measures that insurers could consider to better manage their health portfolios. Atop the above specific measures, health insurers need to have a strong claims monitoring mechanism in order to keep abreast of portfolio experience. Early detection of any fraud or abuse is foremost in helping to ensure that illegitimate claims are arrested early. In order to achieve this, data analysis of past experience would help highlight areas where abuse could occur and enable claims assessors to devote more time and resources to investigate suspicious claims. As the volume of health claims are often high on a daily basis, relying only on the human eye and individual claims assessment to detect abuse or fraud is ineffective. However, employing data analytics to study factors contributing to high loss ratio would enable insurers to manage health claims more effectively and efficiently. Health insurance is a valuable product to consumers and provides much needed protection in times of need for medical care. It is in the interest of all parties in this ecosystem, with the government included, to ensure that health insurance remains affordable and sustainable to all. Careful management of this product is needed and requires strong commitment from the insurers to achieve this. Managing the Cost of Health Insurance in Singapore, 13 October 2016, prepared by the Health Insurance Task Force (“HITF”), Singapore.